Find out what you'll learn in our new R course on tree-based models! Hi R users! We're happy to announce that we've just launched our latest R course: Machine Learning with Tree-Based Models in R! In this course, you'll learn how to work with tree-based models in R. This course covers everything from using a single tree for regression or classification to more advanced ensemble methods. You'll learn to implement bagged trees, Random Forests, and boosted trees using the Gradient Boosting Machine, or GBM. These powerful techniques will allow you to create high performance regression and classification models for your data. Take me to chapter 1! 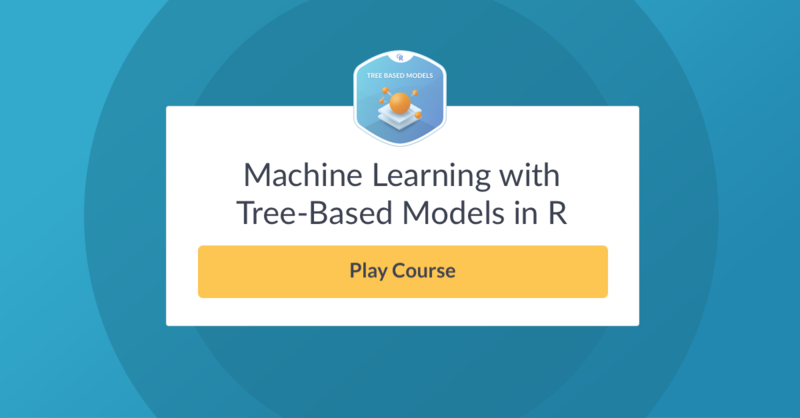 Machine Learning with Tree-Based Models in R features interactive exercises that combine high-quality video, in-browser coding, and gamification for an engaging learning experience that will make you an expert in tree-based models in R! This chapter covers supervised machine learning with classification trees. In this chapter you'll learn how to use a single tree for regression, instead of classification. In this chapter, you will learn about Bagged Trees, an ensemble method, that uses a combination of trees (instead of only one). In this chapter, you will learn about the Random Forest algorithm, another tree-based ensemble method. Random Forest is a modified version of bagged trees with better performance. Here you'll learn how to train, tune and evaluate Random Forest models in R.
In this chapter, you will see the boosting methodology with a focus on the Gradient Boosting Machine (GBM) algorithm, another popular tree-based ensemble method. Here you'll learn how to train, tune and evaluate GBM models in R.
Master tree-based models in R with this new course!